If you suddenly inherited $1 million, with the only stipulation that it had to be invested in the stock market, would you invest it all by nightfall or invest some of the money now and gradually invest the rest over time? Would your answer be different if the windfall were only $1,000 instead of $1 million? For the first question, the better choice is to invest the entire amount immediately. Simple logic, probability, and empirical evidence all dictate that this is always the correct answer, as we will explain. With respect to the second question, many people answer differently based on the amount involved. This is, of course, logically inconsistent, and we will explain the behavioral psychology underlying such erroneous thinking. From 1926 to 2016, the S&P 500 index had a total positive return in 67 years, or 74% of the time. The average annual total return has been about 10%. The expected return on an asset class represents the sum of the current risk-free rate (i.e., inflation plus the 30-day Treasury bill rate) and one or more historical risk premia as compensation for each element of risk. Historically, and based on an average risk-free rate of about 3.5% (consisting of 3% inflation plus a 0.5% premium for cash), the risk premium for large-cap equities has been about 6.5%. To withhold money from immediate investment in equities is to implicitly assume that, over the long-term, there is no premium return available from the asset class. This is wrong. One may debate about the amount of premium available at any particular moment given the valuation of equities, but a premium must always exist to induce investors to own risky assets such as stocks and bonds. Therefore, as long as one assumes equities will continue to provide a positive risk premium above cash, investing immediately must provide better portfolio returns on average than holding cash. Vanguard repeated the process for 100% stock and 100% bond portfolios. The following table shows the remarkable consistency of outperformance two-thirds of the time across countries, regardless of asset allocation. 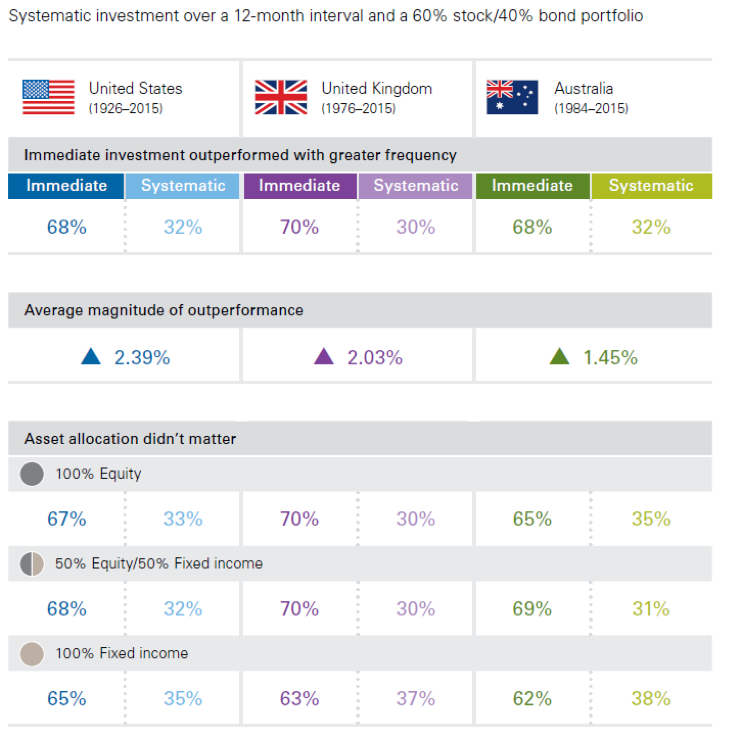 In the case of a 100% allocation to U.S. equities, immediate investment outperformed the systematic plan in 67% of rolling 12-month periods over the 90-year time horizon of the study (1926-2015). Based on annual returns, the equity market is up far more often than it is down—about 75% of the time, in fact. This means that the chances that the market will rise in any given year after you invest are 3 to 1 in your favor. Conversely, the chances that it will fall in the ensuing year are only one in four. So the longer you wait to invest in equities, the more likely it is you will miss out on opportunities for your money to enjoy the premium return associated with the asset class. Countless studies quantify the powerful concept that investor returns from equities are ultimately determined by the amount of time in the market, demonstrating that trying to time the market is a fool’s errand. As just one recent example, consider the years 2010 to 2016, when the total return of the S&P 500 index was 132.8%. The best 18 trading days out of the 1,762 trading days in this period produced an 83.1% gain. Thus, just 1% of the trading days in those seven years were responsible for 63% of the index’s total return. Miss those days and you miss the return associated with the asset class. Because the chance of experiencing negative returns is higher in the short term, the more frequently investors evaluate their portfolios, the more likely they are to see losses and develop loss aversion. By the same token, the less frequently they evaluate their portfolios, the more likely they are to see gains. The attractiveness of the risky asset depends on the time horizon of the investor. An investor who is prepared to wait a long time before evaluating the outcome of the investment as a gain or a loss will find the risky asset more attractive than another investor who expects to evaluate the outcome soon. Although research and history clearly show that immediate lump-sum investments consistently outperform a dollar-cost averaging approach over time, many people choose some variation of the second option, and the long odds against them, because they fear the potential downside of a sudden drop in portfolio value associated with an immediate investment. This irrational fear far outweighs any logical understanding of the 3 to 1 odds in their favor that stock prices will be higher in the ensuing 12 months, and dramatically higher odds still over a decade. Unfortunately, when fear wins out over logic—as it often does, people attempt to minimize the chances of regretting their decisions by investing windfalls slowly over time. But no matter what happens in the markets, the economy, politics or the world, in the long term, you will be better off by investing that lump sum by nightfall, whether it’s $1,000 or $1 million. Go forth and prosper. Although loss aversion is part of our psychological wiring as human beings, the frequency of evaluations is a choice that investors (and their investment advisers) can control. And since most investors are accumulating assets in preparation for a multidecade retirement—or longer, in the case of planned transgenerational transfer of wealth—it makes sense to adopt evaluation periods that correspond with these time horizons. 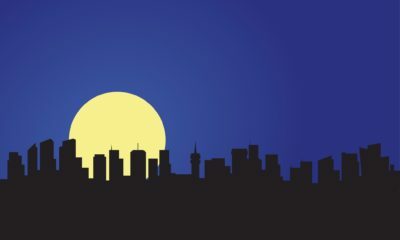 When you have a lump sum to invest, act by nightfall and put it to work immediately. Then once invested, think in decades, not days.